Top them with one of Papa’s fresh, tasty, homemade dressings. A combination of crisp mixed greens, Canadian bacon, pepperoni, mushrooms, tomatoes, green and black olives, onions, green peppers, topped with homemade garlic croutons and Italian cheeses. Served with two slices of our grilled garlic bread. 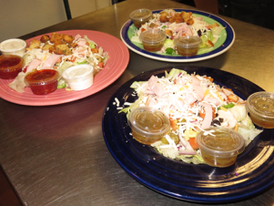 Our Papa’s Chef Salad with a lower fat version for Mama! Substitute turkey for the other meats. Served with 2 slices of grilled garlic bread. Mixed crisp salad greens, pineapple, mushrooms, onions, green peppers, green and black olives, tomatoes, a warm grilled garlic chicken breast cut into bite size pieces, topped with garlic croutons and Italian cheeses. Served with two slices of soft, grilled garlic bread. Crisp lettuce, taco meat, tomatoes, green and black olives, green peppers, onions and cheese. Served in a large salad shell, accompanied by taco sauce and sour cream on the side. Greek style salad, including mixed crisp greens with fresh tomatoes, red onions, black olives, feta cheese, and homemade garlic croutons, topped with grilled gyros strips. Dressed with a special cucumber tsatziki sauce on the side. Crisp mixed greens, fresh tomatoes, black olives, homemade croutons and Italian cheeses.